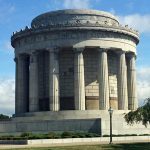 The eighth annual George Rogers Clark Memorial Wreath Laying Ceremony, a National Sons of the American Revolution event, will take place on Saturday, May 25, 2019 at 11:00am EDT in the rotunda of the Clark Memorial at the George Rogers Clark National Historical Park in Vincennes, IN. Ribbons will be awarded to SAR, DAR and CAR chapters; states; districts and national officers presenting a wreath (one ribbon per wreath). If your Chapter intends to present a wreath at this ceremony, please send Robert Cunningham your Chapter’s name, the name of the wreath presenter, the title (office) of the wreath presenter if he or she holds an office, and their email address. To be listed in the program, please send the information requested above by May 18. Wreath presenters are not required to wear colonial attire. Wreath presenters supply their own wreath and stand. All chapter Compatriots, their families and guests are invited and encouraged to attend this ceremony. The George Rogers Clark Memorial Wreath Laying Ceremony is a National Color Guard activity. All participating Color Guard will muster at 10:00am EDT in the Clark Memorial. Please send Robert Cunningham the names of all your Chapter members who will participate in the Color Guard. SAR Compatriots, wives, and family are welcome to come to Gilbert’s Restaurant & Pub on Friday evening May 24 at 6:00pm for dinner. If you plan to attend this dinner, please send Robert Cunningham your name and the number in your party. Robert will make reservations in advance for our group. Gilbert’s address is 1350 Willow St, Vincennes, IN 47591, phone 812-316-0800. Dinner is Dutch treat. Last year several SAR Compatriots stayed at the Towneplace Suites Vincennes Marriott, 1320 Willow St, Vincennes, IN 47591, phone 812-255-1500. We do not have an SAR discount rate, but this hotel is close to the George Rogers Clark National Historical Park and Gilbert’s Restaurant is located just in front of the hotel parking lot. This hotel and other hotels in Vincennes fill up quickly. Make your reservations soon since our ceremony is during the Spirit of Vincennes Rendezvous held on May 25 and 26 of the Memorial Day weekend. Parking for the Wreath Laying Ceremony and the Spirit of Vincennes Rendezvous is available down the road from the George Rogers Clark National Historical Park Visitor Center at 401 S. 2nd St. A limited amount of parking can be found in front of the visitor center. Visitors may park on the neighborhood streets as well, but parking is not permitted along yellow curbs on the street. The earlier you arrive, the closer to the memorial your parking space will be.